Many economists believe that it was our nation’s small businesses that pulled us out of the most recent recession, and there is compelling evidence to support this assertion. It is estimated that businesses with fewer than 500 employees provide at least 50% of private sector jobs in the US. Owning a retail business is not for the slacker or uni-tasker. Owners have to juggle more and more balls just to stay afloat—managing inventory, competing with the e-commerce giants, handling both online and offline sales, complying with yet another workplace regulation, satisfying customers who know as much about your products as the manufacturer—it’s a wonder that any survive at all. Today’s post describes an affordable and easy-to-implement solution to an unnecessary barrier to profitability: employee time theft. The solution is technology uniquely capable of virtually eliminating employee time fraud: a biometric time clock for each of your locations. In addition, biometric employee time clocks provide less obvious but equally valuable benefits to everyone in your organization—human resource professionals, payroll managers, supervisors, and yes, even your employees. We will discuss those benefits after we describe how biometric time and attendance systems lower labor costs. If you are a retail SMB owner, HR associate, payroll manager, or conscientious employee whose company is not yet using a biometric time clock for employee time and attendance, this article is for you. When it comes to retail employee fraud, inventory shrinkage seems to get the most attention. But for many retail businesses, time theft is even more widespread and costly. Simply put, time theft occurs when an employee is paid for time he or she didn’t actually work. Time card falsification can be inadvertent; Ryan accidentally enters 9:00 as his clock-in time when he actually starts working at 9:03. And time theft can be infuriatingly flagrant; Ashley punches in for Jessica who doesn’t show up until three hours into the shift. (Fire them both!) Of course, the Ashley/Jessica buddy punching scheme obviously inflates labor costs significantly, but a careless 3-5 minute padding committed by a larger percentage of employees may be even costlier, though perhaps more forgivable. Do All The Dishonest Employees Work For You? Wage theft is so prevalent in SMBs that business consultants routinely recommend that small employers take it into account when planning labor budgets. According to an anonymous study conducted by corporate investigative firm Kessler International: of 500 employees working in common retail and service industries, over 30% admitted to misrepresenting time worked at their place of employment. It’s not hard to imagine that some who are guilty don’t admit it even in an anonymous survey. So if you fire both Ashley and Jessica, the two employees you replace them with may be just as likely to buddy punch for each other once they work a few shifts together and become friends. Unfortunately, hiring only employees who are honest 100% of the time is impossible in an imperfect world. What are the ways employees willfully commit time fraud? When you are paying workers for time they didn’t actually work, you are unnecessarily inflating what is already your biggest expense—your cost of labor. In addition, labor costs can be unnecessarily high due to human error. How are labor costs inflated non-intentionally? So what’s the financial damage if a typical percentage of your retail employees are padding their time cards or buddy punching? Estimates of the total amount of time employers routinely overpay workers range from 2-4 hours a week per employee. For our example, let’s assume that you are paying an extra three hours a week per employee. If the average hourly wage in your company is $12, and you have 30 employees, the grand total is $56,160 dollars in overpayment each year. If you have employees who leave the business on the clock to travel to another location, make deliveries, pick up supplies, or run miscellaneous errands, you are even more vulnerable to time theft. Here’s Your Company Card—Have Fun! Making it easy for your employees to falsify time cards makes about as much sense as leaving your stores unlocked at night or giving each employee a company credit card. Swipe cards were supposed to solve the problem of employee time theft but proved to be woefully inadequate. They get lost. They get bent. They get dirty. They can be lent and borrowed. When an employee complains that the machine won’t take his swipe, you are back to the shaky ground of trusting him to honestly report his hours. So if swipe cards can’t prevent time theft, what is the answer for identifying your employees in a way that can’t be exploited? Enter biometrics. If you are unfamiliar with the term, take it apart. Bio (biological) + metric (measurement). Simply put, biometric technology verifies a person’s identity by analyzing a unique physical or behavioral attribute. The most common physical identifiers for biometric employee time clocks are a fingerprint, palm, iris, or the entire face. 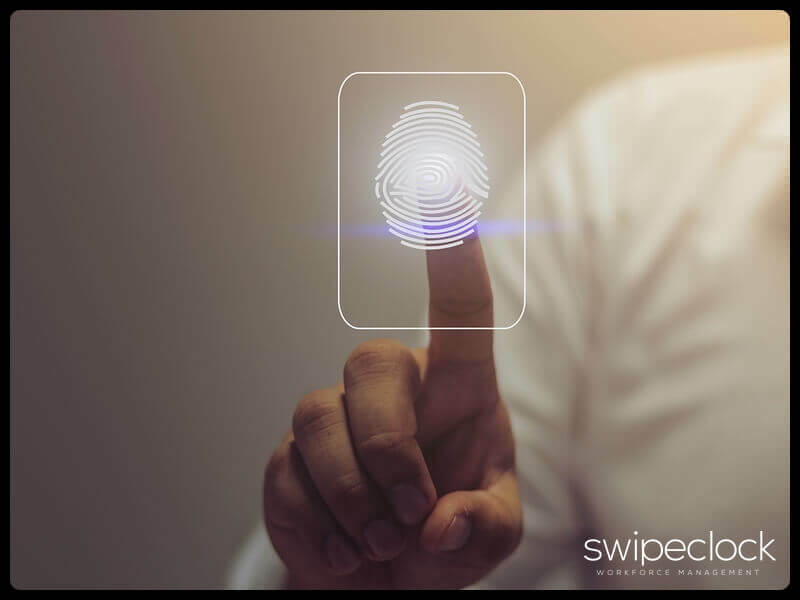 Biometric technology is used in myriad applications such as law enforcement (particularly border control and surveillance), healthcare, and access control. It is also not limited to the hands, face and eyes. Biometric devices can use identifiers such as voice characteristics, keystroke rhythm, and personal odor (insert wisecrack here). Biometric time clocks for small retail businesses is a match made in heaven for the retail business owner or HR manager who adeptly uses technology and automation to successfully manage day-to-day operations. But even if technology isn’t your forte, rest assured that SwipeClock biometric time clocks are not difficult to implement or use. They do, however, make it nearly impossible for employees to steal time. Ashley simply can’t punch in for Jessica anymore. And Ryan can’t fudge his time card. And Derek can’t lose his iris as easy as he can lose a swipe card or key fob. Picture Tom Cruise getting a hairy black-market eye transplant in Minority Report. It’s a significant deterrent for most retail employees. In addition, your supervisors won’t have to track missing time card information, and your payroll manager will automatically have accurate employee hours worked data from the timekeeping system synced with the biometric time clocks. And your HR team won’t have to manually calculate PTO accruals. Many small business owners think cutting-edge biometric technology is prohibitively expensive. In the example cited previously, however, a retail business with thirty $12/hour employees loses $56,160 a year in time theft. Talk about expensive! And just to reiterate, the estimate is for a typical retail business, not an outlier. Your business might have more time theft than the average. Retail businesses have many different challenges, but shrinking profit margins seems to concern most every owner. One of the golden questions often asked is “How can I increase my profits without raising my overhead?” By adopting SwipeClock biometric time clocks at all of your retail locations, you can reduce the big chunk of your overhead that is your payroll expense—and increase your profits without even touching any of your other fixed or variable costs. Worried That Your Employees Can Protest Due to Privacy Laws? First off, most people have already accepted the fact that Google knows when you brushed your teeth this morning and has probably already asked you to leave a review of your toothpaste. That said, note that many states have restricted the type of biometric information that an employer can require. Before purchasing a biometric system, make sure you know the laws that affect you. Employers who train their employees when introducing a biometric time clock at their workplace will explain the mechanisms that protect them from the misuse of their data. We can help you with an effective implementation plan that will include employee education about the safeguards in place to protect their information. At SwipeClock, we have discovered that most retail employers who have adopted biometric time clocks in the past few years received less employee resistance than expected and were able to adequately address their workers’ concerns. Hopefully, we have successfully made the case that biometric time clocks lower labor costs for retail SMBs. We will now describe some additional benefits that biometric employee time and attendance systems will bring to your organization. Keep in mind that this is not an exhaustive list. Many small businesses have implemented smartly designed technology to improve efficiency in areas of operation such as merchant transactions, inventory management, and CRM systems. Strangely enough, however, many HR departments are using outdated systems for employee time and attendance tracking. Let’s look at a typical journey for one time card in such a system. Each employee enters his or her shift start, shift end, and break times for each shift of the pay period onto his or her time card. When time cards are due at the end of the pay period, a manager views and approves each employee’s time card. If there are errors, the manager has to track down the information to make corrections. When the time card is submitted to HR, an HR team member manually enters the data into the payroll system. At least three different people touch each (physical or online) time card in order for the payroll system to generate a paycheck for each employee. Imagine if each customer sale was as cumbersome as this. And each step of this manual journey provides an opportunity for error. SwipeClock biometric time clocks automatically capture employee punches to the minute. The data is then automatically synced with Workforce Management Suite or your employee timekeeping and payroll system. Human error is removed from the equation and your HR team suddenly has 20 more hours a week. And your supervisors will not miss all that time card detective work. Labor law compliance can be a full-time job for the small business owner or HR manager. Large companies have the resources for massive compliance departments and extensive legal teams dedicated to protecting them from labor violations. Regardless, billion-dollar global companies are penalized for wage hour violations every single year. Disney was recently ordered to pay several million in back wages due to an FLSA action. Retail employers are subject to provisions regarding minimum wage, overtime, family leave, predictive scheduling, and extra hours for part-time employees. Accurately tracking hours, schedules, PTO, and overtime is priority one when complying with the various labor laws—FLSA, ACA, FMLA—and any local or state-level laws that apply. For some retail employers who adopted a biometric time and attendance system, the compliance benefits were the greatest motivator, even more persuasive than the reduction in labor expenses that resulted from the implementation. Accurate employee schedule information that can be readily accessed and validated is your protection against a labor violation resulting from either an audit or employee dispute. Retail employees who are required to use a biometric time clock know that they will get paid for every minute worked. That type of assurance is valuable for those employees you want to keep; the ones who understand that accountability works both ways. A biometric time clock allows you to recognize your prompt employees who arrive on time, punch out for unpaid breaks and meals, and clock out when authorized. Giving credit where credit is due improves employee morale and lowers turnover. Any employer who has been in business for a while knows how employee attrition significantly increases labor expenses. In addition, biometric time clocks capture actual time worked for precise overtime and PTO calculations, both of which can be an administrative headache and compliance vulnerability. In summary, small retail employers have much to gain financially from implementing a biometric time and attendance system, but the improvements to workflow, compliance security, employee accountability, and a reduction in time spent on non-billable activities are just as compelling.